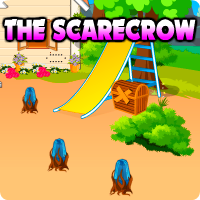 AvmGames - Avm Find The Scarecrow is another point and click escape game developed by Avm Games. Howdy Farmer! How goes the harvest? Not well, huh? Those evil, good-for-nothing birds! They eat most of the seeds we plant on our fields. What should we do against it? How can we keep them away? Scare them? How? Ohh I see... That's a good idea. Let's build scarecrows all over our lands. What do we need? Pumpkin for the head! Find everything you need and make those scarecrows. It will be not that easy as you might think. There are some difficult puzzles in our way to getting the necessary components and parts. But I have faith in you. You will save our crop! Good luck and have fun! in start sc, click on the buttons starting from where the hand points and follow the lines. how many times do you press the buttons? got it! got new scene but no axe. Still have paper with 64937.